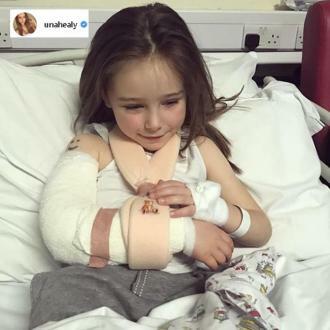 Una Healy's daughter was taken to hospital after chipping a bone in her elbow following a ''freak accident''. Una Healy's daughter has been hospitalised after a ''freak accident''. The 36-year-old Saturdays singer - who has Aoife Belle, five, and Tadgh, two, with husband Ben Foden - revealed her ''brave little trooper'' had undergone surgery after chipping a bone in her elbow when she fell over, and expressed her thanks to medical staff who were caring for the youngster. She shared a photo of Aoife Belle, with her arm in a cast and sling and a smiley face drawn on her shoulder, and wrote on Instagram on Tuesday (23.01.18): ''Our brave little trooper Aoife Belle. She suffered an unfortunate freak accident where she tripped and chipped a bone in her elbow that ended up requiring surgery. Meanwhile, Una has previously spoken of her struggle with postpartum depression after giving birth to her son. She said: ''I didn't suffer first time round. It had a lot to do with circumstances the second time. However, Una is ''feeling great'' now and hopes opening up about what happened will help other women going through a similar situation. She added: ''I went to the GP and they prescribed me anti-depressants. I gave them a go but started to feel worse because I was so numb. ''But it's [anti-depressants] a great resource because it's worked for other people. I literally had locked myself up in a dressing gown for six weeks. But I have also seen a behavioural therapist. I'm quite an anxious person because I worry all the time. 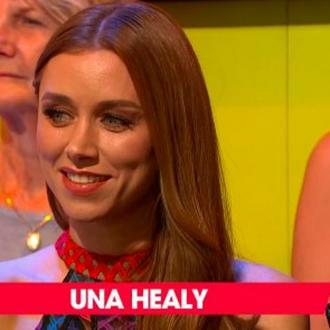 Una Healy to turn to acting?